From the eighteenth century navigators relied on nautical charts produced by a handful of chart makers and instrument sellers who worked in the City of London. These privately produced charts, or bluebacks as they were known from the tough blue manilla paper on which they were mounted, were in circulation amongst the merchant fleets of the World until the Second World War. Susanna Fisher's meticulously researched history tells the story of the families and companies that dominated this trade from the 1750s until the present day. 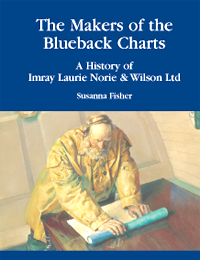 The makers of the blueback charts were among the great cartographers of their day and names like Sayer, Laurie and Findlay are well known to anyone who has an interest in old sea charts. The high and low fortunes of their businesses and the London world in which they lived and work is colourfully portrayed. The story of private chart making is also more or less the history of Imray, Laurie, Norie and Wilson Ltd which is the descendent of the old publishing firms and to this day flourishes as the leading private publisher of nautical charts and pilot books.